IK Multimedia presents the iKlip A/V, a broadcast mount for audio and video recording with smartphones. With the different tablet and smartphone formats, choosing the right support can be a real issue. IK Multimedia brings you the solution. Protection Racket has launched a new case for protecting an iPad/Tablet and carry-on items. IK Multimedia announces iKlip Mini, the microphone stand adapter to support iPhone and iPod touch devices is now shipping. Kinsman introduces a new range of Clamp-On Holders for musicians. IK Multimedia, makers of the iKlip for the iPad, announces iKlip Mini, a microphone stand adapter for all versions of Apple's iPhone and iPod touch. AViiQ announces the availability of the Smart Case for iPad 2. 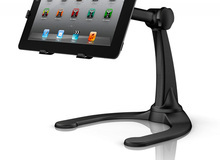 IK Multimedia has announced that they are now shipping their iKlip 2 iPad mounting accessory. IK Multimedia announced that iKlip, the universal mic stand mounting kit for iPad, will soon also support the new iPad 2 with the addition of four snap-in adapters.